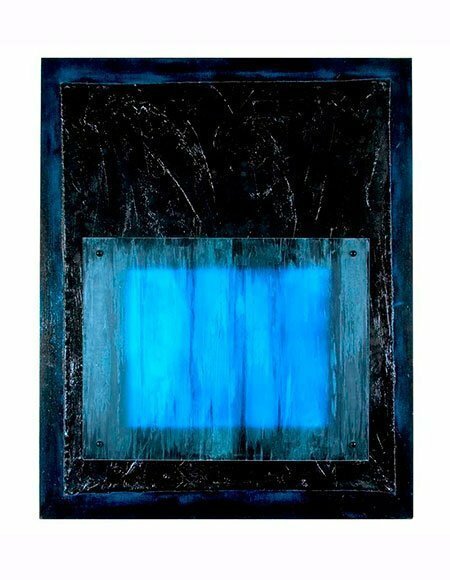 With an otherworldly, somewhat somber presence, Huether’s Black on Blue is in some ways the antithesis of the Dichroic Fin Paintings, which celebrate the luminous and prismatic qualities of white. 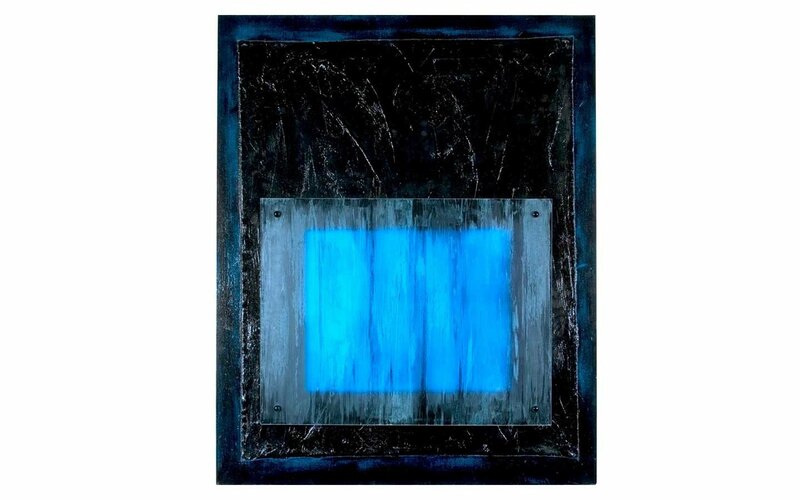 Black on Blue, conversely, explores the evocative potential of the color black; given that white, in the form of prismatic light, contains all colors, black may be similarly regarded as the absence of color. While black is often associated with death or evil, artists such as Kasmir Malevich have found it the perfect vehicle to express the sublime, with Malevich stating that he “saw the face of God” in his black squares. A subtle hint of electric blue peers around the edges of the canvas, which is also barely tipped with a few dots of red. This work, like the Fin Series, also features viscous, broad strokes of paint. 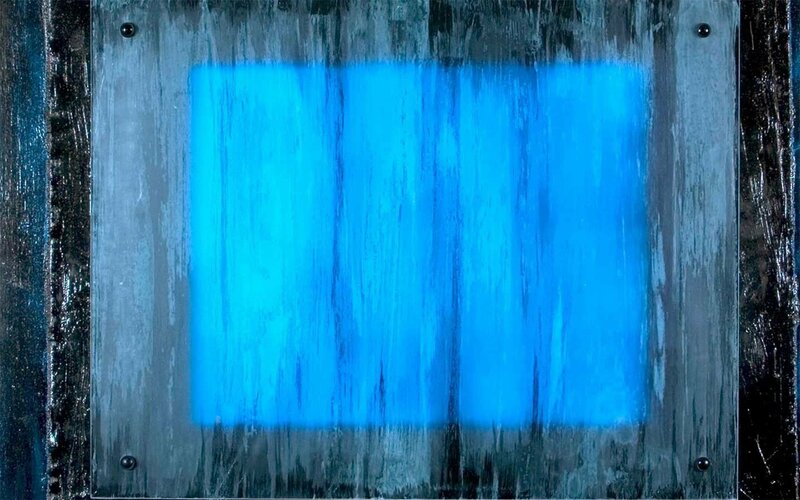 A layer of etched glass hovers above the surface, veiling a plate of dichroic glass beneath, shimmering with a vibrant blue. The pane may suggest a window, looking out onto an expanse of sky or sea, yet also, jarringly, suggesting a TV screen. 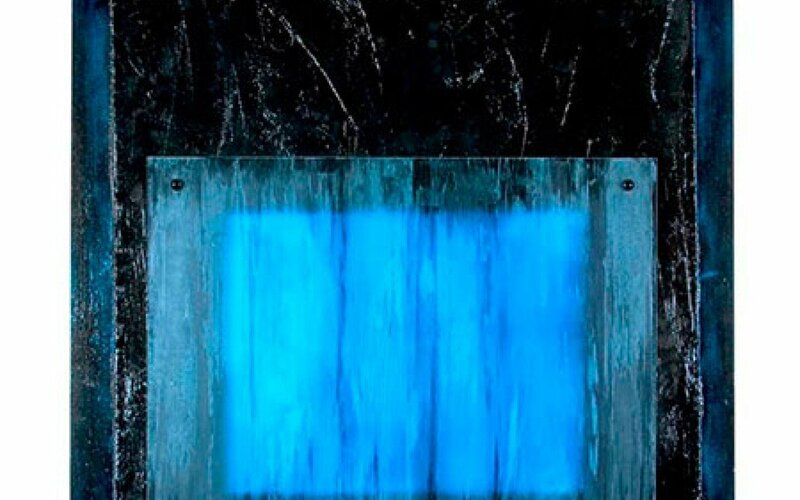 Any imagined depth into a landscape is short-circuited by our recollection of the flatness of the picture plane, and that all space in two-dimensional artwork is ultimately illusional – the only true depth displayed here the shallow layering of wood, canvas, paint, and dichroic and etched glass.